SPS has been offering education based on the Montessori Method to the pre primary children. Developed by Dr. Maria Montessori, the Montessori Method is based on an understanding of a child's tendencies and addresses a child’s need. The aim is to maximize a child’s independent learning and exploration. All the pre-primary classrooms are equipped with Montessori materials. While some of the material equips the children for their day to day activities, the use of others enables the children to use their senses for their development. Arithmetic and language learning becomes easy and permanent through the specially designed materials with which children work every day. There are two teachers available throughout the day in the classroom to facilitate learning. Class library with picture books have been set up in each classroom for enhancing the thinking skill and imaginative power of the children. Pre Primary children are given the opportunity to hone their skill in various fields such Art and Craft, Music, Dance and Games. Educational trips and picnics also form the part of the curriculum. 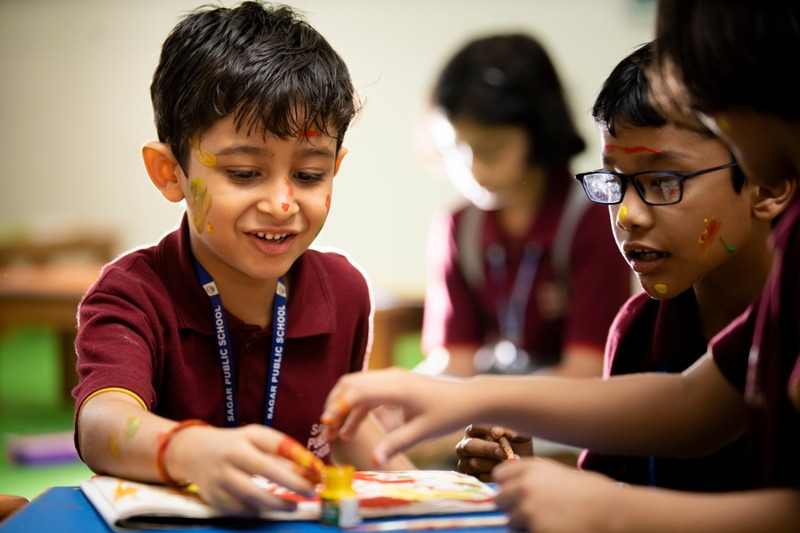 In the Kids' Room at SPS, the children engage themselves in fun filled activities. In the Adventure Zone they engage in endurance and stamina building skills. Various competitions like English and Hindi poem recitation, Hand writing, Coloring and Fancy Dress are organized in the school to develop their innate potential. No formal test is conducted for the Pre Primary students. The performance of the child in all spheres is monitored regularly which forms the basis of their promotion to the next class. NOTE: BROWN COVERS ARE ONLY FOR BOOKS. RHYMES 3 SAPPHIRE (INDIA) PUBLISHERS PVT. NOTE: BROWN COVERS ARE FOR BOOKS ONLY.